Anna, almost daily: "Can we have dinner at 4:30?" Me: "It will be ready at 5." Me: Makes dinner at 4:30 today. Anna: "I'm not that hungry, I didn't think we'd be eating so early." I made the marinara sauce in the slow cooker a couple weeks ago and froze it. We recently bought a stand up freezer for the basement, so I'm going bananas filling it with homemade soups, sauces and breads. The marinara sauce was super easy, 10 minutes of prep, and 10 minutes at the end to blend. I made my sauce thick by draining a little liquid off the top of the canned tomatoes before adding them to the slow cooker pot. If you prefer a thinner sauce, you could leave that liquid in. Simon described the sauce as tasting "rustic," so take that as you will. You don't have to worry too much about chopping, because you'll blend it all later anyway, so you can leave things chunky, which cuts back on prep time. 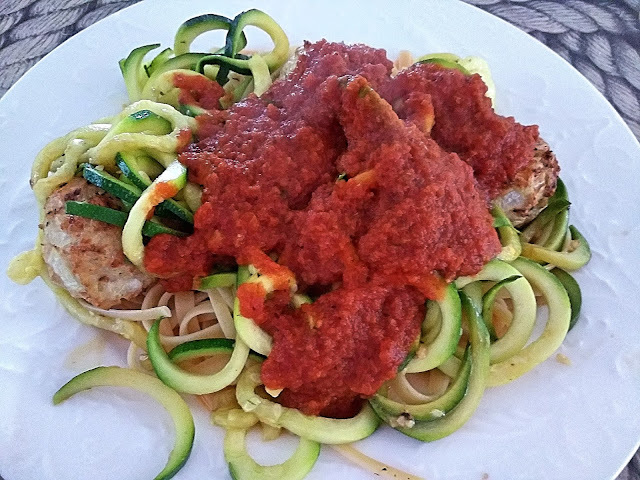 I served this with Chicken & Rice Meatballs, spiralized zucchini "noodles" sauteed in olive oil and garlic, and fettucine. Layer all the ingredients in the slow cooker and cook on low for 8 hours. Remove bay leaves and use immersion blender to blend until smooth. Serve immediately, or allow to cool, and scoop into freezer friendly containers to freeze for later use.